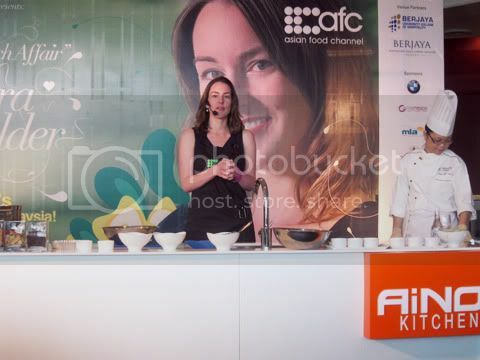 If you watch the Asian Food Chanel frequent enough, you would have caught Laura Calder on her show, French Food At Home. I was born in rural eastern Canada and grew up on home-made bread, unpasteurized milk, and organic vegetables in a house built by my great-grandfather. Despite the exasperating kitchen, I loved cooking from a young age. I won first prize at a fair when I was six for my “chocolate cake with peanut butter icing”, and a few years later I pulled off my first multi-course dinner for my family: I got my little brother to serve it (wearing a tea-cozy on his head and my grandmother’s high-heeled shoes) and every dish on the menu contained cheese. She’s on her first tour to Asia and Malaysia, well naturally. She may not be as veteran in tv like Nigella or Jamie or Gordon Ramsay but her style is what appeals to me. I was particularly surprised when she sounded and talked exactly like how she is on TV, ok maybe she talked a little more during the LIVE show, but well no one’s to blame. I find that having interactions with guests / viewers are as important as being able to produce a good plate of steak. Or probably an inch more important from my point of view. Her show, French Food at Home, talks mainly about …… cooking French food at home, surely enough. 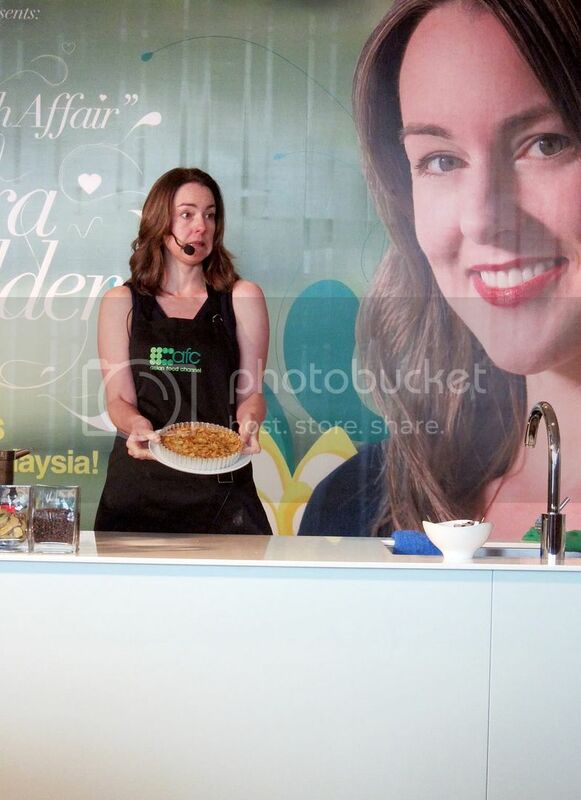 And during her introduction of herself during the show, she talks about how people always have a misconception that French food are so haute cuisine, unlike the English food, more homey and home-friendly. 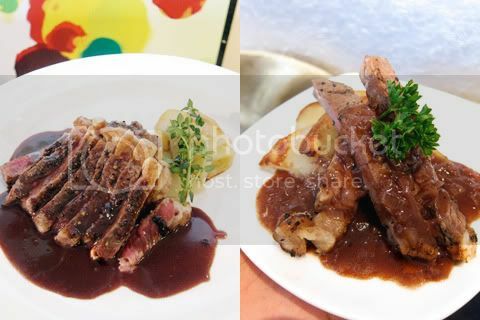 But indeed, French food can be very simple as well and be incorporated into everyday life for normal people like you and me. French cooking, like I learnt, involves quite a bit of technique and precision (pastry wise). But it can also be versatile enough, to be simplified for home cooks. That way, we don’t have to pay a super ridiculous price for a 3 or 5 course meal. But either way, the more types of cooking show shown on tv, the better an exposure it is for everyone else around the world. Back to the show. Ok I like it when chefs come to the country and starts a live cooking demo or some sorts. I’ve seen Jamie Oliver in Sydney a long long long time ago. Peggy Porschen was last year but well she does cakes. 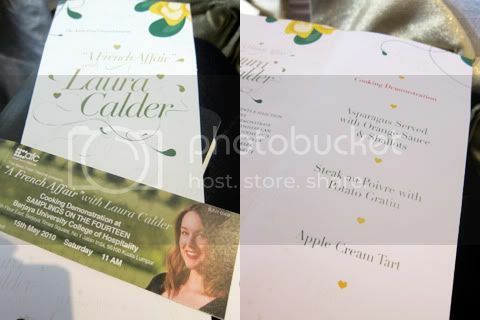 And this time around, it’s Laura Calder. Like I mentioned, her style is simple, clean and laid back. Because that’s how we cook at home right ? less stress = better food LOLs.. The menu for the cooking demo was Asparagus, served with orange sauce and shallots, Steak au poivre with Potato Gratin and Apple Cream Tart. She starts of by making the tart base, which was a breeze. I tell you there was no rolling involved, no weighing-down-with-beans, no chilling in the fridge. It was just crumble flour and butter and some other stuffs. Then press the crumbs into the pie dish and baked. That’s it!! I should try the crust. I really really don’t like handling sweet shortcrust pastry in my kitchen, hence I don’t make much pies / tarts. The Apple tart, baked! And throughout the entire show, she didn’t use any mixer / processor for the pastry, or filling. I mean, I really get what she’s trying to portray. Even if you don’t have any KitchenAids or funky machines at home, you still can make nice and delicious food. It’s more like promoting simple cooking at home, instead of buying takeouts and deliveries. By the time your pizza is delivered to your home, your steak would have been cooked and ready. Cause all you need is just a couple of minutes on each side. After cooking a couple of months at home, it really isn’t that difficult. All you need is just a little bit of planning. If you don’t have time to buy ingredients every day after work, just buy them all once a week. Just make sure there are some essential items like oil, salt and pepper those kinda things in your pantry lar..
Anyway… let’s not get carried away. So during the show, we were also served food samples of whatever she cooked. 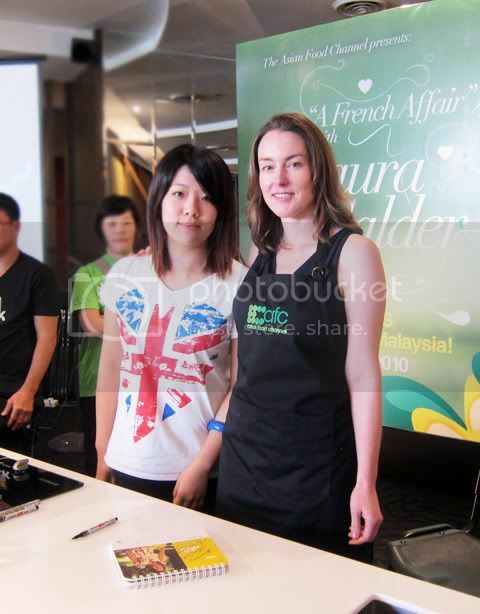 Laura only cooked one portion but the rest of portions were cooked by the students of Berjaya following her recipes. Well, it’s ok. I can take that. 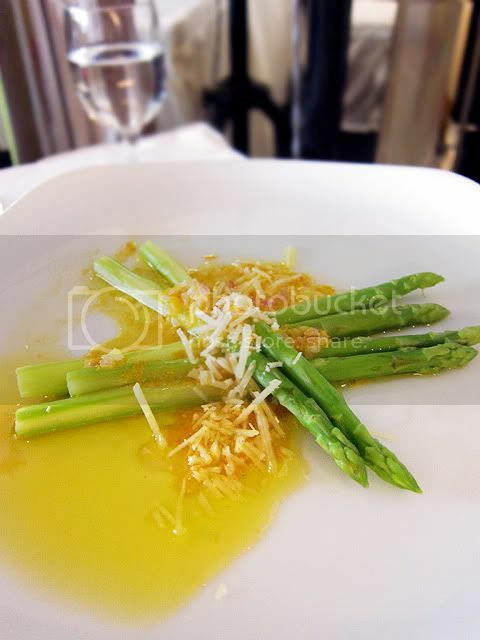 Asparagus, served with orange sauce and shallots. The orange sauce was nice, refreshing and appetizing. The only thing that was a turn off was the orange zest, which sometimes can be a bit bitter. So If I make this, I’d probably use orange peel for the sauce and take it off before serving. Apple Cream Tart. The tart shell itself is ingenious. because it was SOOOO easy to make yet it’s a pretty good tart shell. 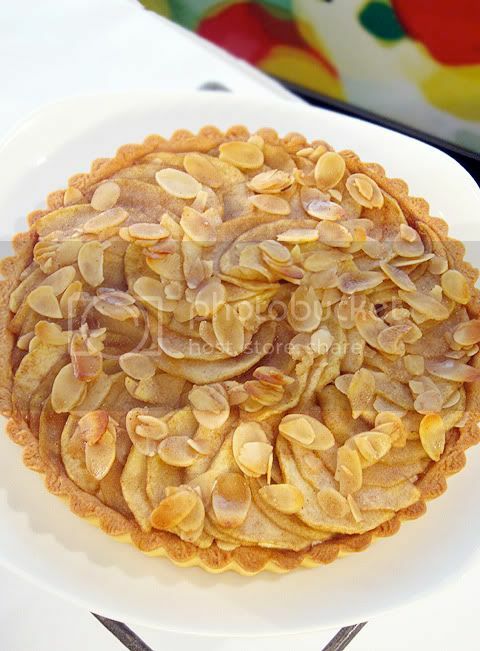 Alot of apple tart (french style) uses frangipane (almond cream) as part of the filling. This one, Laura uses cheese as the filling, (mascarpone or cottage or cream cheese is fine) then layered sliced apples on top with some almond flakes. It’s a nice and homey tart, not too heavy. Yup, that were the 3 courses served during the demo (of course all small sample portioned sizes lar) But well, good enough to fill our stomach. tee hee hee ..
Last section of the demo was a photo and autograph section. The amount of people wasn’t by hundreds so each of the guests had a chance to have photo with her and her autograph as well. AFC staff were very kind to that. You know sometimes all theses celebrity shnizzles always have very tight securities and no to this and no to that. She’s soooo tall. I was wearing flats, so was she..
And then I realized after that …. dammit why did I wear this shirt …. 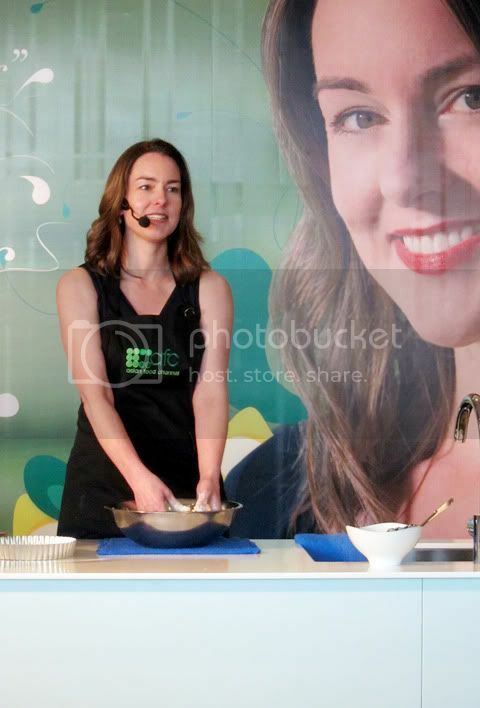 But all in all, I enjoyed the show and will keep watching Laura Calder’s French Cooking at Home. If you haven’t so, start watching now in Channel 703 in Astro. PS: If you’re in the US and have never heard of her, don’t worry, the show French Food at Home will start airing on May 31st in the Cooking Channel. OMG I'm so jealous. I really wanted to go, if it weren't for the price. She certainly don't look like herself on TV. Sounds like you had a lot of fun. I've certainly heard of her but she's not very well-known in Australia. I like how she make cooking a breeze, everybody can cook and should! Will you be posting the apple tart recipe? The tart base sounds easy and I quite like tarts and pies and quiches! Oh lucky you! Not only you got to taste the food, you also taking pic with her! So jealous! Haha! Laura Calder is my idol!! hehe! I love watching her cooking show on lifestyle channel. Love her gracefulness and she is all class!! @Ellie: And her food is easy to follow! LOVE Laura Calder – and Yay for her being Canadian (the country I now call home!). You're right, she might not be Nigella but she definitely has a great style! So envious you got to meet her!